The United Nation's, today, approved South Korean Foreign Minister Ban Ki-Moon to serve as the next U.N. secretary-general. The last Asian leader to serve in this post was U Thant, from Burma, serving from 1961 to 1971. He will be the eigth secretary-general to serve and he will assume the post on January 1, replacing the scandal plagued Kofi Annan, from Ghana, who has led the world body for the past 10 years. 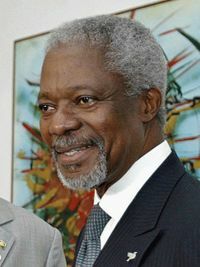 Scandals under Annan's leadership included, sexual harassment, oil-for-food program, and the world bank corruption along with others like the UN "agreeing to pay the legal fees of Benon Sevan, the disgraced head of the oil for food programme, out of the funds raised from the Iraqi oil sales"1, and "the destruction of thousands of critically important documents by the UN chief of staff"2 relative to the investigation of the oil for food scandal. And a good riddance, I might add. Ban said to the asssembly, "I will work diligently to materialise our responsibility to protect the most vulnerable members of humanity and for the peaceful resolution of threats to international security and regional stability." He also had this to say, "The true measure of success for the U.N. is not how much we promise, but how much we deliver for those who need us most." Approving of Ban's appointment, U.S. Ambassador John Bolton said, "'We believe he is the right person to lead the United Nations at this decisive moment in its history, particularly as the UN struggles to fulfill the terms of the reform agenda that world leaders agreed to last fall." Here's to hoping that Ban will be able to accomplish what Annan could not. Well, I guess that's not setting the bar very high. Let's say I am hoping Mr. Ban will be able to accomplish meaningful reform. Some Things Just Need To Be Said posts on this topic as well. I also blogged on this. I look in hope but realize the enormity of the challenge before him. He is one man of high regard among thieves, children and liars. We can only hope.